Slashdot founder Rob "CmdrTaco" Malda recently announced a new Slashdot section dedicated to offtopic humor, memes, viral videos, and pictures. --It's at Idle.slashdot.org. He said it's been beta tested for the last few months but I've only heard about it today. Slashdot Idle (can I call it this way?) is basically a section of Slashdot where people can submit just about any content they like without having to worry about being looked down upon by some of its Geek supremacist readers. An article like "German Police Women to Get Bullet Resistant Bras" and this photo of a Nintendo Superhero will likely not make it on the frontpage of Slashdot. However, there's actually a 'chance' that some of the contents at Idle.slashdot.org will be posted on the mainpage. --I would say the chance is rather slim as CmdrTaco clearly says he wants new and fresh content at Slashdot's precious mainpage and wouldn't dare soil it with crappy and recycled articles. 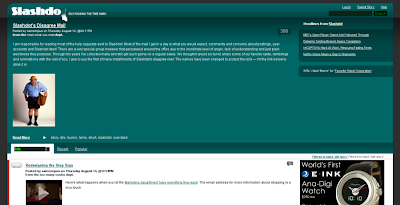 If you visit Idle.slashdot.org or look closely at the screenshot below, you will see that the header image is a doodle of the original Slashdot logo. I noticed that the header logo is linked to the main page of Slashdot.org and not to the home page of Idle.slashdot.org. I don't know if this is intentional or not. Anyway, the page is dynamic with interactive voting just like in Digg and Reddit. You can submit articles without having to register, but you have to sign-up if you want to vote. "If I want LOLcats, I go to Digg. If I want Pseudo-Politics, I go to Reddit. If I want to know about the latest announced Apple product, I go to appleinsider. If I want to know about the worlds largest TV, I go to The Register. If I want actual Intellectual articles with in-depth discussions, I come to slashdot. Please don't ruin this for me." What's my take on Idle.slashdot.org? --I'm cool with it as long as it's all good fun. If you hate it because you are intellectually superior, then use your brain and just type slashdot.org on your web browser's address bar without the "idle." in front. Got it?